37 streets in Ann Arbor being resurfaced this summer: Did your street make the list? 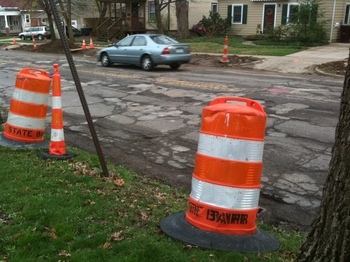 Posted on Tue, Mar 27, 2012 : 5:59 a.m.
Ann Arbor residents can expect to see nearly double the number of streets under construction throughout the city this summer compared to years past. "It's going to be a busy summer. Lots of orange barrels," said City Administrator Steve Powers, welcoming the increased improvements. With the money the city is saving from having state and federal grants pay for a large portion of the Stadium bridges project, the city is putting its local street millage dollars to use with more than three dozen resurfacing projects planned. In addition to previously reported projects on Packard Road, Hill Street and Dexter Avenue, the city released a list of 33 more street resurfacing projects expected to be completed between April and November. That includes six major streets and 27 residential streets. Three dozen other streets, in addition to this crumbling stretch of Dexter Avenue, will be resurfaced as part of the city's 2012 street improvements. In addition, the city is planning to resurface East Stadium Boulevard from Washtenaw to Packard as part of a separate contract. Major street projects on the new list include portions of Huron Parkway, West Liberty Street, Glen Avenue, Geddes Avenue, South Fifth Avenue and South Seventh Street. Some of the residential streets getting resurfaced include Canal, Pineview, William, Fourth, Third, Berkshire, Woodside, Forest and Meadowbrook (see full list below). Because of the large number of street projects this summer, the city has sorted them into two separate programs this year, Program A and a Program B.
Barrett Paving Materials Inc., with offices in Ypsilanti, won both competitive bid processes. The City Council is expected to vote April 2 on a $3.6 million contract for the 13 projects in Program A, followed by an April 16 vote on a $4 million contract for the 20 projects in Program B.
Homayoon Pirooz, head of the city's project management unit, said a list of street projects planned for 2013 is incomplete and tentative, but he confirmed the city is planning to completely reconstruct Miller Avenue from Newport to Maple Road. In years past, the city has taken on about 15 to 20 street projects each summer, Pirooz said, noting this is the first year of the city's ramped up efforts. Until now, the city was saving up street millage dollars in case it needed to take on the Stadium bridges project alone. Pirooz said this will be the first of multiple years of larger resurfacing programs now, but he predicted there shouldn't be too big of an impact on traffic. "Whenever there's road construction, you will have slower traffic in the streets, but most of these are residential streets," he said. "And with the resurfacing of residential streets, we typically don't see a major change in the traffic patterns." Ann Arbor voters in November renewed the city's street millage with 77 percent support. City officials said last summer that 47 percent of the city's streets are rated "very good," 24 percent are "good," 21 percent are "fair" and 7 percent are "poor." Tue, Apr 17, 2012 : 12:41 p.m.
Mon, Apr 16, 2012 : 3:32 p.m.
Where is Huron Parkway and Fuller? Program A lists Huron Parkway from Hubbard to Fuller. I believe it should ready Glazier Way. To my knowledge, there is no Huron Parkway and Fuller intersection. Mon, Apr 16, 2012 : 2:36 p.m. I, for one, would be interested to know how these streets are selected for improvement while others get ignored. For example, East Stadium between Packard and Brockman has been one of the worst streets in town for YEARS! Especially, eastbound... Maybe the City Councilperson who &quot;represents&quot; that area has no influence! Why isn't Stone School Road between Packard and Ellsworth on the list? That stretch of road is absolutely horrible. Perhaps it was excluded because it's now an alternate route around the reconstruction on State &amp; Ellsworth, meaning it'll be fixed next year? I hope, because it's an axle-breaker. Wed, Mar 28, 2012 : 3:44 a.m. I sure hope when they repave E. Stadium they don't stripe it like they did W. Stadium and limit the number of travel lanes and add those bike lanes that I have never seen anybody use. Mon, Apr 16, 2012 : 6:29 p.m.
Maybe the cyclists would be there if you weren't incredibly hostile and also if the bike lanes were smooth enough to even permit people to use them. Besides, when the stadium bridge is closed, who would use that stretch of road on a cycling route anyway? Tue, Mar 27, 2012 : 10:52 p.m.
Tue, Mar 27, 2012 : 10:45 p.m. Guess I'll use the Geddes Road roundabouts, even if I don't get onto them from US-23. Looks like Earhart would be a good substitute for the portion of Huron Parkway getting resurfaced. Tue, Mar 27, 2012 : 9:47 p.m.
Ryan, Articles like this would be more useful if you included a summary and links to previous articles covering other roads under other juristdictions and/or city project pages discussing the various road projects planned. There's also plenty of detail about what's planned for future years in the a2.gov CIP plans. Otherwise you get the regular &quot;but what about this road&quot; comments that have already been covered in other articles or about which there are plenty of details with simple googling. Tue, Mar 27, 2012 : 7:41 p.m.
&quot;With the money the city is saving from having state and federal grants pay for a large portion of the Stadium bridges project, the city is putting its local street millage dollars to use with more than three dozen resurfacing projects planned.&quot; I've heard this over and over--that the streets were allowed to go to pot supposedly because the City was saving money in case they needed it for the Stadium Bridges. Why didn't they just issue bonds--either for the bridges or for the streets so that they could stay on schedule with repairs, resurfacing and replacements? They borrowed for the City Hall expansion, for the underground parking structure, for the greenbelt purchases, for the sewage treatment plant, etc., etc., etc. Why not borrow for something we actually needed? I've lived in Ann Arbor since 1978. This is the worst I've seen the roads in all that time--and it's not just a few places--it's all over the City. It will take years to catch up--especially when streets like Seventh have to get redone only a few years after being reconstructed. Who is supervising the work? Tue, Mar 27, 2012 : 6:45 p.m.
Huron is a state Business Route, and not within the city's decision making. There's been recent public meetings about upcoming work on it. Fourth Avenue, between Washington and Huron, is a disaster. I hate to take the whole lane on my bike, but there's no alternative. I expected to see Fifth Ave. on the list - but work only goes South to Liberty. Wonder how long the Parking Structure work will keep Fifth Ave. closed. Let's assume they'll pave it when it opens. Tue, Mar 27, 2012 : 6:29 p.m. I'm checking with the city to see if there is an updated report on the condition of the city's streets. Will write a story on it when I get it, if it's been updated since last summer. Tue, Mar 27, 2012 : 6:17 p.m. The Huron Parkway? Again? They never cease working on this roadway, whether it needs it or not. Very disruptive. How about the stretch of Carpenter from Washtenaw to Packard. That's the worst stretch of road in the city. Why does this not get resurfaced??? Tue, Mar 27, 2012 : 10:47 p.m. I know what you mean: the right southbound lane of Carpenter from Washtenaw to Packard is very rough. Tue, Mar 27, 2012 : 5:07 p.m.
Are they sure they have enough $$$ for this? There is still a lot of cracks in the sidewalks and old sidewalk ramps that aren't fixed causing massive shoe damage... and will these roads have signs and lights so the uptight pedestrians can stop traffic and cause accidents? Tue, Mar 27, 2012 : 4:20 p.m. According to the article, &quot;city officials said last summer that 47 percent of the city's streets are rated &quot;very good,&quot; 24 percent are &quot;good,&quot; 21 percent are &quot;fair&quot; and 7 percent are &quot;poor.&quot; Did the process for selecting streets take these ratings into account? Combine this with a rating for traffic demand, and I would think officials could have had a much more transparent selection process. The omission of Miller between Newport and Maple and other ideas on this thread suggests the decisions were made politically and/or arbitrarily. Tue, Mar 27, 2012 : 9:36 p.m.
Tue, Mar 27, 2012 : 3:35 p.m. I live on Duncan Street, it is a mess. There is more gravel and potholes on the street than pavement. We have had four or five water main breaks this winter, which left the street with big sink holes where the excavations were done. This is the main entrance/exit to Haisley School and the busses have wreaked the street. I will bet that there is not one street on the list that is worse than Duncan. By the way, Duncan turns into Alice St at its south end and there is no pavement left on the south (eastbound lane) side of Alice. It is all frost heaves and potholes. Tue, Mar 27, 2012 : 3:15 p.m.
What's wrong with Huron Parkway between Hubbard and Fuller? I drive it everyday and it's perfectly fine!! What a waste of money. There are plenty of other streets that need attention. Also, they need to pave Chalmers Ave. It's costing them a fortune to resurface it with dirt every few weeks just to have it washed away by rain. The high traffic through there (between Washtenaw &amp; Huron River) clearly justifies it. Maybe it's not paved because Hyundai drivers their test vehicles through there every week (to test how terrible roads affect suspensions). Tue, Mar 27, 2012 : 10:54 p.m.
Huron River Drive isn't mentioned, but I do remember Thomson-McCully resurfacing it at Foster Bridge. I wonder if there's a continuing agreement to keep Thomson-McCully maintaining that part of Huron River Drive. The Fourth St. section mentioned is absolutely horrible, so it's good they're doing it. But road stretches should not be allowed to get to that point before repaving. Also, Scio Church Road from Maple to Wagner badly needs re-paving. I know that's a Scio Township issue, but it still needs it. Scio Church Road forms the southern border of Scio Township, Maple Road forms the eastern border. Lodi Township's northern border is Scio Church Road, and it's directly south of Scio Township. Pittsfield Township is immediately to Lodi Township's east side. Tue, Mar 27, 2012 : 3:10 p.m.
No Ann Arbor-Saline? That road is horrible to drive on. Tue, Mar 27, 2012 : 9:39 p.m.
Tue, Mar 27, 2012 : 2:15 p.m.
Tue, Mar 27, 2012 : 11:31 p.m.
Reading your comments brought Charing Cross to my mind. That road doesn't dead-end at a freeway. I know that area has been annexed to the city. Tue, Mar 27, 2012 : 8:39 p.m.
Rudedog - I have to pass over the dirt road oasis to and from my neighborhood off of Chalmer's road every day. Yep, I knew it was dirt when I bought, and yes, I'll have to pay the assessment when it ultimately gets paid. Needless to say, you and I will vote differently on this issue when asked. As for &quot;embarassment&quot;, I'm referring to people's embarassment on the pot holes in our paved streets. These pot holes pale in comparisson to the terrain I travel on a daily basis on Chalmer's. Hey Rudedog, what's your name? Do you your friends just call you &quot;rude&quot; or the more hip &quot;dog&quot;? ;-) please have a sense of humor on this one. Regards, Terry. Tue, Mar 27, 2012 : 3:23 p.m.
Terry - I live on one of those &quot;dirt road oasis&quot; and I like it. You are correct in saying that we do not want to pay the special assessment! I see no point in paving, putting in sidewalks and lights for a road that ends at the expressway. If you do not like our &quot;dirt road oasis&quot; than don't drive on them! And how is living or having dirt roads an embarrassment? My neighborhood fought city hall in 1997 when they wanted to pave our &quot;dirt road oasis&quot; and I will fight them again! If you want to pay our assessment, please send me your address and I will make sure all of my neighbors get it so you can pay for the job! Tue, Mar 27, 2012 : 2:11 p.m. I second Keith's request - please mark all these areas on a map. Tue, Mar 27, 2012 : 2:42 p.m.
My guess is that it would reveal how little resurfacing is actually to be done. I see at least two one-block-long courts on the list. Tue, Mar 27, 2012 : 2:09 p.m.
Tue, Mar 27, 2012 : 2:02 p.m.
Jackson/Huron and N. Main belong to MDOT, they are not city streets. I think I read MDOT was planning on redoing Jackson in 2014 or something like that. Don't know about N. Main. Tue, Mar 27, 2012 : 9:42 p.m.
@SMC: How do you know they haven't been? Michigan has been underfunding roads for years, as our politicians are afraid to raise the gas tax. There's a long line for the minimum dollars we do have to fix MDOT-maintained roads. They are planning to fix Jackson / Huron in 2013. It looks like North Main is on the list in 2015, but I might be reading the MDOT CIP incorrectly. Tue, Mar 27, 2012 : 2:10 p.m. The question isn't whether or when MDOT is planning on fixing two of the biggest streets in our city, the question is, why hasn't it been done already? Why hasn't our city council been up MDOT's nose to get these streets repaired? Their condition would be appalling if this were Bangladesh, not a town that has a world-class university and hosts the biggest sporting events in the state every fall. Tue, Mar 27, 2012 : 1:37 p.m.
For the love of all that is holy, why are neither Jackson/Huron or North Main (north of Depot) on that list? Not only are these stretches of road particularly bad (the pavement undulations at the intersection of Huron and 1st are enough to make you think something on your car has broken as you drive over them), but these streets represent two of the gateways to downtown. What a lovely way to welcome visitors to our fair city, with flat tires and broken suspension parts on their cars. Some others have mentioned that these streets are under the jurisdiction of MDOT for some reason or another. While I don't know if that's true, even if it is, our city council needs to get off of its collective backside and do something about this, call the governor, lobby the road commission, whatever. Instead, they waste their time listening to people crying over some lady who faces deportation (because the federal government will surely reconsider their decision if the esteemed and illustrious Ann Arbor City Council disagrees with them), passing resolutions that serve no useful purpose (Ann Arbor is officially against every war that has ever been declared, in case anyone cares), or trying to come up with solutions for problems that should not even exist in the first place, like when they pass a traffic law without first studying the effects it will have on traffic. Unfortunately, this is good old Ann Arbor, where the elected officials can (and do) pass the buck on something as important as the condition of our primary traffic arteries through the city, so they can focus more on saving the spotted woodland tree mouse, or whatever it is they're busy with. Tue, Mar 27, 2012 : 11:25 p.m.
Nobody's complaining about the roads near the stadium that got flooded almost two weeks ago, such as Snyder and Potter. I guess flooding doesn't rough up paved roads. We'll get news stories later this summer about streets that flood frequently, but that appears to be a different topic, different road problem with a different solution. Tue, Mar 27, 2012 : 9:43 p.m.
@SMC: Michigan has been underfunding roads for years, as our politicians are afraid to raise the gas tax. There's a long line for the minimum dollars we do have to fix MDOT-maintained roads. They are planning to fix Jackson / Huron in 2013. It looks like North Main is on the list in 2015, but I might be reading the MDOT CIP incorrectly. Tue, Mar 27, 2012 : 2:01 p.m. While it is true Huron/Jackson is MDOT jurisdiction. You are ABSOLUTELY correct. City officials should be shouting from the top of Bell Tower to get this fixed! Tue, Mar 27, 2012 : 1:20 p.m. I wish Pittsfield Township would fix Carpenter Road. There are more potholes than smooth surfaces on that pock-filled street. Tue, Mar 27, 2012 : 1 p.m.
Ann Arbor-Saline Road by I-94 and Stone School Road near Ellsworth are terrible. I wonder if these will make the list in the near future. Tue, Mar 27, 2012 : 9:44 p.m.
Tue, Mar 27, 2012 : 5:06 p.m. I'm pretty sure A2Saline/I94 is already on the schedule for MDOT. I read that somewhere, maybe not on A2.com, but repairs are on the way! Tue, Mar 27, 2012 : 3:08 p.m.
Agree completely about the Ann Arbor-Saline Rd. area right at I-94. That's an embarassment to the city since so many out of town people come here via that intersection. Why they didn't resurface that a couple years ago when they were doing all that work on the bridge underneath is completely beyond me. A2/Saline by 94 is an MDOT road. You should write you state representatives. Tue, Mar 27, 2012 : 12:43 p.m. I wish AnnArbor.com would publish the map showing the &quot;very good, good, fair and poor streets&quot;. I hope they are going to paint the lines on some of the streets that are not being resurfaces. West Liberty west of Dartmoor to the city limit. Tue, Mar 27, 2012 : 12:39 p.m.
Pauline could use a little work between Stadium and Seventh especially. Tue, Mar 27, 2012 : 12:38 p.m. I'm happy to see S. 7th from Pauline to Madison made the &quot;B&quot; list ... That large hole in the north-bound lane seems to get larger every day. It will soon swallow up a small car. I guess the mechanics/tire stores are happy with the current disrepair of our streets - good for their business. Wed, Mar 28, 2012 : 7:41 p.m. It's very easy to report potholes to the city, they have a special phone number for it: 734-99-HOLES. Or you can put in a service request online: http://www.a2gov.org/government/publicservices/customerservice/Pages/OnlineCustomerServiceRequest.aspx I've found that holes I called in were patched pretty quickly, in the next day or two. Tue, Mar 27, 2012 : 12:15 p.m.
&quot;City officials said last summer that 47 percent of the city's streets are rated &quot;very good,&quot; Rated so by whom using what standards? And who believes that? Mon, Apr 16, 2012 : 6:26 p.m.
SMC: It's laughable that you think cyclists would give any road a better rating than a driver. Cyclists are more likely to suffer personal injury from roads in poor condition, or drive instead of cycle (which replaces a cyclist with another car that is keeping the roads congested and taking up parking spots that you probably want too). If you're a driver, you should want roads to be smooth for cyclists and bike lanes- they're not competing for the same parking spaces as you and they don't congest the road lanes like cars do. Tue, Mar 27, 2012 : 11:54 p.m.
Just to be clear, it's not a WBWC rating. Street condition is rated by city staff according to a standard engineering method: http://www.a2gov.org/government/publicservices/project_management/annual/Pages/StreetSelectionProcedure.aspx Data gathered by our Technical Services Unit. This Unit gathers data on the condition of the City's streets and updates it on a regular basis. The condition of the pavement on streets, or segments of streets, is evaluated based on a variety of factors and a number between 1 and 100 is calculated for each street. This number is called the Pavement Condition Index, or PCI. Typically, the streets with the lowest PCI rating are added to the &quot;long list&quot; of streets to be further evaluated. Tue, Mar 27, 2012 : 3:22 p.m. The survey looked at all the street surface in the city, and the great majority of that is residential streets which are not in bad shape. Tue, Mar 27, 2012 : 2:41 p.m.
Don't tell me - a WBWC survey? Tue, Mar 27, 2012 : 1:21 p.m. The survey group consisted entirely of cyclists and pedestrians, who never drive. Anyone who drives anywhere in this town knows that our roads would be considered horrible in most developing countries. Tue, Mar 27, 2012 : 12:01 p.m.
Rather than the streets jetting off Madison, how about Madison itself from Seventh to Main??? Before and since the Stadium bridge project, this is a heavily travelled route that ihas been in serious disrepair for some time. It is always amusing and ridiculous to see the City trucks out there filling in countless potholes....where are the priorities here??? Tue, Mar 27, 2012 : 1:24 p.m. If the bridge project has increased the traffic on Madison, how does shutting Madison down for resurfacing, during that construction, make any sense at all? I'm sure it isn't any fun for anyone living on/near that street, but the hopefully the inconvenience is only temporary, and Madison will be repaved once the bridges are done. It is literally unbelievable that they are not redoing W Madison. It is impossible to bike or drive down that street without getting some kind of groin injury. Mon, Apr 16, 2012 : 3:10 p.m. It's possible, if you swerve properly and don't worry / care about getting hit by cars. Tue, Mar 27, 2012 : 11:33 p.m. Agreed! I used to live over there and I absolutely hated driving in that area. My husband, who would bike to work, had to find alternate routes it was so bad!! Tue, Mar 27, 2012 : 2:08 p.m.
My thoughts exactly. the stretch between 7th and Main is absolutely ridiculous. Tue, Mar 27, 2012 : 11:55 a.m.
Ann Arbor is a first-class city and deserves to look like one. Repairing shabby streets is a worthy project and is money well spent. Tue, Mar 27, 2012 : 1:26 p.m. I'll take trashy-looking smooth roads over impassable ones that feature well-manicured grass nearby. Priorities. Yes, but if no one picks up the trash along the streets or cuts the grass and weeds along the public right-of-ways it will still look trashy. Those services seemed to have ended years ago. Tue, Mar 27, 2012 : 11:54 a.m. The small stretch of southbound State between Packard and Hoover just before the intersection at Hoover looks like the ocean. It's one of the busiest pieces of roadway in Ann arbor and is less than 30 yards long. It's like one of those torture tracks that the auto companies use. I think the rippples are caused by the large number of busses that travel it and stop at the intersection. It would be a relatively small repair that would have a large impact on the suspensions of thousands of vehicles. Not sure why the city is paving so many &quot;courts&quot; which are dead ends that are travelled only by the few residents who live there and ignoring some of the major problems that affect thousands each day. Tue, Mar 27, 2012 : 9:46 p.m. I agree with EBL - it's pretty bad. There's also some interesting pavement contours in the road in the westbound lane on the west side of the State &amp; Washington intersection. Those concrete pads would probably be useful in these places. Tue, Mar 27, 2012 : 5:29 p.m.
Chicago pours concrete pads where the buses stop regularly. It stops the asphalt from sagging over time. My guess is that with all the activity going on there right now, it would cause havoc to also resurface (which probably would require a new foundation ) during the bridge reconstruction. My bet is on next year when there are sufficient alternative routes. Tue, Mar 27, 2012 : 11:53 a.m.
All I can say is that it has been a long time coming! Tue, Mar 27, 2012 : 11:27 a.m.
Tue, Mar 27, 2012 : 11:25 a.m. So, Fifth Ave. will open finally between William and Liberty, but will be closed for resurfacing from Huron to Liberty. Hope it doesn't take too long. Tue, Mar 27, 2012 : 11:07 p.m. So, Fifth Avenue will be resurfaced between Depot Street and Beakes. I thought it was very rough as I drove on that part of it earlier this month. Tue, Mar 27, 2012 : 10:57 a.m.
Thu, Mar 29, 2012 : 8:26 a.m.
Miller is in absolutely terrible shape and has been for years. It was originally scheduled for work in 2010 or 2011. It keeps being put off. At this point, the City has lost all credibility with me as to its scheduling. I'll believe it when I see it. Tue, Mar 27, 2012 : 8:46 p.m.
One day on WB Miller, I thought I was following a drunk driver weaving back and forth until I realized it was to avoid the dangerous ruts and I was doing it too. Tue, Mar 27, 2012 : 5:27 p.m.
Tue, Mar 27, 2012 : 2:48 p.m.
Tue, Mar 27, 2012 : 1:16 p.m.
Bcar, you hit the nail on the head. Miller Ave. is a mine field. I aways figured they let it go in order to keep speeds down. I dread driving on it. Tue, Mar 27, 2012 : 12:22 p.m. It is scheduled for next year with a round about at Newport. Tue, Mar 27, 2012 : 11:38 a.m.
Not resurfacing Miller between Spring and Maple. Guess they are saving it for tank testing. Tue, Mar 27, 2012 : 10:49 a.m.
Dexter Rd from Maple to Huron has got to be in the top 5 worst roads in Ann Arbor, yet every year it gets left off the list for repairs. When on earth is it going to be resurfaced?? Tue, Mar 27, 2012 : 10:51 a.m.
Oh. Never mind. I should have read the article before looking at the list. Yay, Dexter Rd! Tue, Mar 27, 2012 : 10:25 a.m. I'm not really sure why Huron Parkway gets it, or why they resurfaced Dixboro last year. They are not/were not anywhere close to as bad as Huron all the way to Maple. Fix Huron!! Tue, Mar 27, 2012 : 12:17 p.m.
Huron is under the jurisdiction of the MDoT.